Tess O'Brien of Bloomberg Associates chairs a session during the workshop. Image courtesy of David Levenson. Having focused our first few months in operation on the ‘digital doers’ (those who’ve been working hard to get the Local Digital Declaration agreed and socialised) and budget owners, we were keen to turn our attention to the most senior technical and digital leaders in local government. We think of these people as the most senior digital, data and technology leaders of cities and local authority jurisdictions. They come in many guises, with differing job titles (often CIOs, CTOs, CDOs) and differing powers. And as a network, they’re critical in shaping the Local Digital movement. 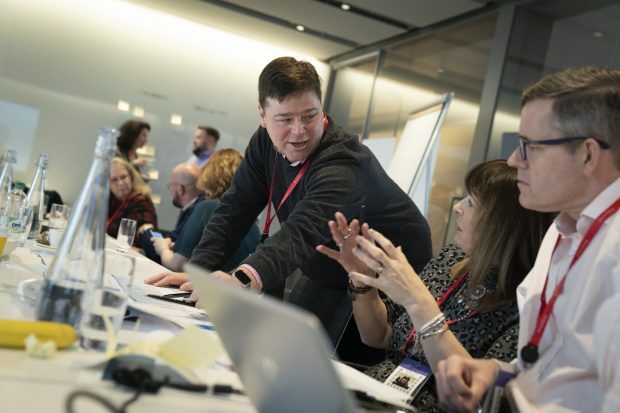 So, on 12 February, with the help of Bloomberg Associates and the support of Socitm, we convened 10 local authority Chief Digital Officer level leaders from across the UK to better understand their needs and how we could support them. In this blog, we'll share where we got to, and what we’re planning to do next as a result. You can also read the longer write up from the day if you're interested. Identify opportunities for some of these challenges to be overcome more easily together, and identify this network’s needs of the convening organisations. Linda O'Halloran preparing to cluster ideas. Image courtesy of David Levenson. CDOs have to strike a tricky balance between “keeping the lights on” for internal IT and hundreds of services, while also shaping the vision for how the authority will serve its jurisdiction in the future. They have little scope to discuss the bigger picture with other budget owners until organisational tech works smoothly - and until they’ve demonstrated the value of user-centred service design to solve someone’s problem/ show the art of the possible. The main responsibility of the CDO is to convert and empower service owners to lead data-driven, user-centred services. This is complicated by the fact that user-centred design can mean fundamentally restructuring these services, moving away from existing professional divisions (because user problems are interrelated and not necessarily the responsibility of 1 service area). 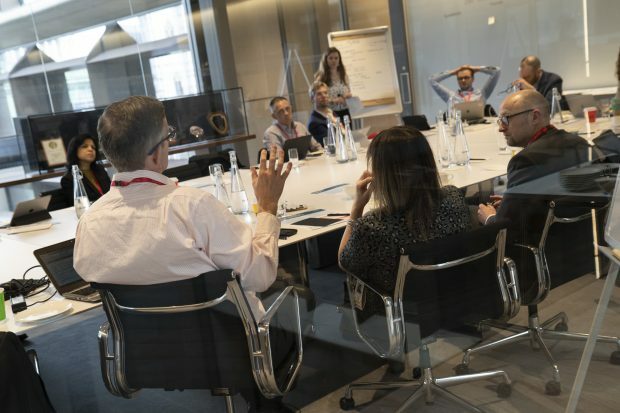 CDOs are best enabled by political and executive leaders who are more comfortable with internet-enabled technology, ways of working and contracting. We need to build capacity among those less comfortable with these new ways of working and procuring to better empower digital leaders. The breadth of the expectation using limited resources: It’s hard to lead culture change and develop a more digital vision for the organisation when they’re mostly expected to be IT support, fixing laptops and wifi. Governance and management of data - data is not stored in a meaningful way for reuse. Identifying opportunities for collaboration with similar organisations, and actually collaborating when opportunity identified due to lack of standards between operating systems used by different services. Vendor lock-in: the market is too closed to buy what we need and know is technically possible off the shelf. For this reason, a collaborative market intervention is necessary. Service owners and sector bodies for different local service professions need to be converted. They are the stakeholders that can drive change. Sam Smith, Theo Blackwell, Sandra Taylor and Mikko Rusama mapping out the challenges faced within their roles. Image courtesy of David Levenson. Documenting the powers, responsibilities and organisational position of different kinds of municipal digital leader. The purpose is to help organisations recruiting for this role to figure out how to get the right kind of person and powers in place to meet their local needs. Create a collection of examples of successful and unsuccessful projects from the authorities gathered, and trying to frame it in a way that reframes failure as investment in learning. The stories need to be brief, honest, and ideally in a standard format for easier digestion and comparisons. We imagine stories should be about ‘fix the plumbing’ themes like standards-based service development and data-sharing, and include cultural and technical lessons. Create more semantic overlap in training offers to CDOs and to colleagues they’re supporting to help develop shared languages between digital, data and technology professionals, and everyone else needed to transform local services. MHCLG proposed to use Local Digital Declaration language where possible, and have planned to offer digital leadership course modules through LGA and Socitm leadership training - in addition to the training they’ve already commissioned through GDS Academy. They and Socitm plan to work together to widen this effort through Socitm courses. The possibility of meeting again as a network whilst also inviting senior leaders of each organisation (e.g. chief executives). MHCLG will ask each represented local authority to offer a success and failure story to see if Bloomberg Associates and MHCLG can turn them into a useful learning resource. 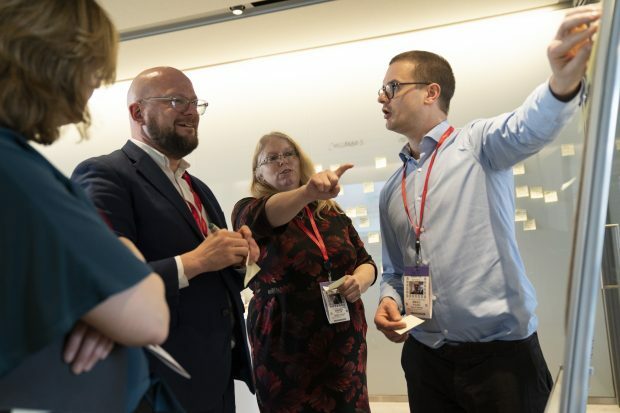 Bloomberg Associates will help MHCLG to develop a first iteration CDO role tool, outlining what makes for a more successful digital leadership role in different local contexts. Socitm will observe MHCLG - GDS Academy Digital Leadership pilot (done) and identify opportunities for content and narrative overlaps with Socitm training. Likewise, Socitm to share their training offer plans to help MHCLG and GDS Academy identify opportunities for join-up. Bloomberg Associates will host a reunion of the group during Tech Week 2019 in London to track progress and discuss further work. Ed Garcez, Alison Hughes and Dylan Roberts discuss before feeding back to the whole group. Image courtesy of David Levenson. If you want to see further details from the CDO network workshop event, you can read our publicly shared full write-up here. We're currently kicking off the work outlined above, and we’ll share progress updates soon! To stay connected to the work of Local Digital, register to receive our fortnightly newsletter and follow us on Twitter @LDgovUK. Wondering whether the session asked the existing Digital Leaders (whom I'm assuming put themselves forward for this) whether or not they thought leading on both the shaping and delivery of transformational vision, and on business as usual delivery is the right thing to be doing? This issue comes through in the Biggest Themes, especially the first three, and the position doesn't seem to be challenged (although I've not had time to read the full details on the separate link where it may be)? Are the skill-set and personal capacity required to run an IT service successfully, especially in a larger organisation, aligned with what's required to lead the development of the vision, and design, plan and lead deliver of it? "data is not stored in a meaningful way for reuse"
Do we need to separate the vision and direction for "reuse" from the issue that "data is not stored in a meaningful way"? They need to align to ensure the objective (~ reusing data to deliver greater value) can be met, and need to work collaboratively to make that happen, but are the skills themselves likely to be held at the right level by one person? Is it reasonable to expect that one person will have the capacity to fulfil the breadth of leadership requirements? Are we missing the trick here when it comes to working collaboratively, where the whole would be greater than the sum of the parts? This blog post is an attempt to summarise the full open write-up of the day's discussions, rather than present a researched position. It was our programme's very first foray into the questions at the top of the blog. So, we were keen to start small, report openly, and build on what we learn based on this steer. You may find some more discussion on your areas of interest in the longer version. 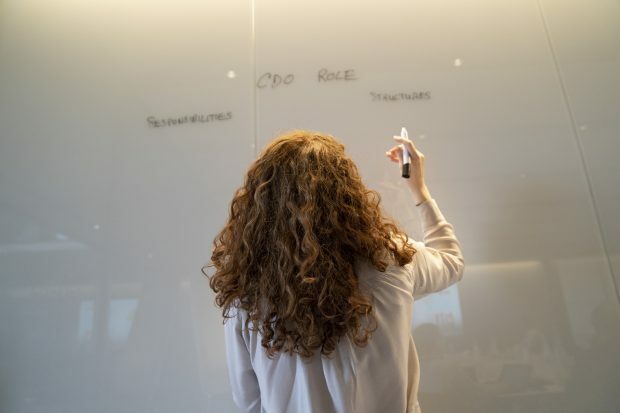 On whether 1 person should be responsible for digital vision and technology and infrastructure, we tried to be agnostic about what the role of CDO or digital leader should look like. Rather, we aimed to gather a broadly representative group of people in this category and invite them to talk about what's working and what's not. So, the workshop highlighted that, for various reasons, a single digital leader is often expected to do both the digital vision and tech fixer role. On the back of this discussion, we're starting research with Bloomberg Associates to dig into this situation a little more, better understand how these responsibilities are distributed in different councils, and try to spot patterns about what's working and what's not. We'll present findings to the group (and openly on the internet) which may suggest that the role is best cut up in a certain way. If you've got experience you could contribute to this, we'd be keen to include it. So, all thoughts for the attention of Matt welcome! On who got invited, we invited people rather than requesting volunteers widely, leaning on Socitm to help us ensure that the group was broadly representative. We chose the group to be large enough to represent different kinds of council and small enough to have a single conversation with. (We also aimed to make it as gender balanced as possible).